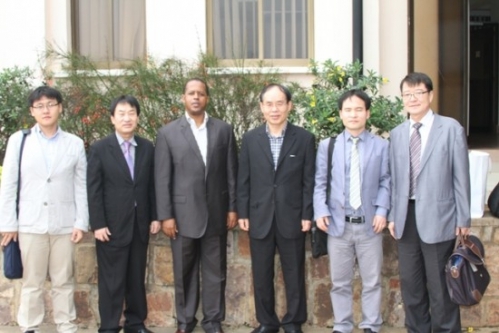 Korea Aerospace University will establish a Training of Trainers (ToT) center at IPRC-Kigali. Published on February 2013 by Emmanuel Nuwamanya on WDA website. A delegation from Korea Aerospace University located in Goyang City, Gyeonggi-do, South Korea yesterday held discussions with the director general of WDA Jerome Gasana over the establishment of a role model center for Training of Trainers (ToT) at IPRC-Kigali. By the end of 2013, a construction design may have been developed to enable construction which is also expected in the next two years. This team working under the Technology Management Transfer center includes Hun Hyung Kim, Myung Hee lee, ChangHo Lee, and JongTaek Kim. Their stay in Rwanda will enable them to gather enough information about the TVET system in Rwanda so as to come up with a basic design a ToT center that will serve as a role model forming competent trainers. According to the director general of WDA Jerome Gasana, since the number students in TVET schools is increasing, emphasis has to be put on improving the quality of education through having fully qualified trainers. Gasana further said that such kind of a ToT center is expected to serve as a one stop center through which other centers across the country can borrow best practices on many courses offered in TVET. Both parties in this new development also concur on the idea to link trainers with the industry so as to acquire more knowledge on business operations, incubation, and apprenticeship programs. WDA looks forward to having a centre of this kind that will be quality based on reference to the already existing role models. KAU promotes skilled persons with strong leadership qualities and professional competence in the domain of aerospace science and technologies, as well as in other academic fields that are essential to the development of any society. Through its International assistance program (KOICA) Korea has been supporting TVET specifically IPRC-Kigali. Kagame : "No Rwandans troops in Mali"